Military action will not last more than a week. No one would argue that this war has not come at a high cost in lives and treasure. 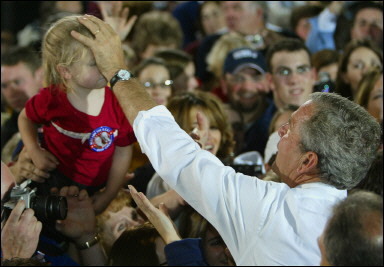 ~ George W. Bush (1946-07-06 age:71), 2008-03-19, George thinks he is a pirate. That’s George Washington, the first president, of course. The interesting thing about him is that I read three — three or four books about him last year. Isn’t that interesting? The course of this conflict is not known, yet its outcome is certain. Freedom and fear, justice and cruelty, have always been at war and we know that God is not neutral between them. ~ George W. Bush (1946-07-06 age:71), 2001-09-20, in other words, Gott mitt Uns, speech to Congress. God told me to strike at al Qaeda and I struck them and then he instructed me to strike at Saddam, which I did and now I am determined to solve the problem in the Middle East. If you help me I will act and if not, the elections will come and I will have to focus on them. according to Palestinian Prime Minister Mahmoud Abbas, from minutes acquired by Ha’aretz from cease-fire negotiations between Abbas and faction leaders from the Hamas, Islamic Jihad and the Popular and Democratic Fronts (circa, 2003-06), quoted from Arnon Regular, ‘Road map is a life saver for us,’ PM Abbas tells Hamas (Haaretz.com: 2003-06-27). Bush is so full of it he expects us to believe that God too was deceived about the presence of WMDs (Weapon of Mass Destructions). ~ George W. Bush (1946-07-06 age:71), 2004-07-16, to a group of Amish he met with privately. First reported in the local papers, including the Intelligencer Journal and the Lancaster New Era. I am carrying out divine commands. No President has ever done more for human rights than I have. I believe God wants me to be President, but if that doesn’t happen, it’s OK.
Texas 1999 at a meeting attended by Richard Land. I’ve heard the call. I believe God wants me to run for President. I’ve coined new words, like, misunderstanding and Hispanically.